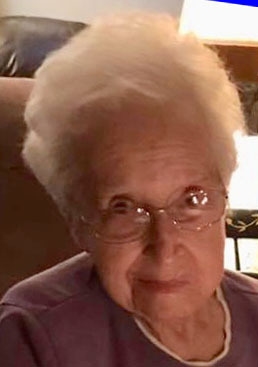 Obituary for Sarah E. (Elder) Whitling | McEntire-Weaver Funeral Home Inc.
Sarah Ellen Elder Whitling, 94, of Knox passed from this Earth to her heavenly home on March 22, 2019 with her daughter, Susan, at her side. Born November 23, 1924 in Blair’s Corners, Beaver Township, Pennsylvania to the late Ira Minor Elder and Eva Marie Amsler Elder, she was the last surviving member of her immediate family. She was an angel on this Earth, a beautiful person, loving mother and a wonderful grandmother and GG. She graduated in 1941 from St. Petersburg High School. On December 4, 1945 she married Walter Henry Whitling, who passed away September 18, 2008. They had celebrated over 50 years of marriage together. Sarah was a very faithful member of St. Mark’s Memorial Chapel in Kossuth. In her earlier years she was an accomplished seamstress and crocheter, an extremely good cook and one of the best pie and cookie makers ever. She grew beautiful flowers and took care of her home impeccably. She was the most patient and understanding person you would ever meet. Sarah was blessed with four children, David Earl Whitling and his wife, Karen, of Sandersville, Georgia, Susan Marie Whitling Deitz and her husband Bob of Transfer, PA, James Edwin Whitling and his wife, Virginia, of Jasper, Georgia and Karen Elaine Whitling Ziegler and her husband Tim, of Portland, Texas all of whom survive her. Also surviving are her 7 grandchildren, all of who were so very special to her. David K. Whitling of Atlanta, Georgia, Andrea Deitz Porter and her husband Wes, of Knox, Kristin M. Deitz Beck and her husband Brian of Swansboro, North Carolina, Matthew W. Whitling and his wife, Courtney of Lexington, South Carolina, Leann L. Whitling Christensen and her husband, Carl of Everett, Washington, Jill E. Whitling of North Charleston, South Carolina, Christopher A. Ziegler and his significant other, Jenny DeFee of San Antonio, Texas and her dear great grandchildren, Jaykeb M. Porter of Knox, David A. Whitling of Georgia, Alyssa M. Beck of North Carolina, Kasidy Sease, Jason & Alexandria Whitling and Baby Whitling due in June, all of South Carolina, Braxton and Parker Christensen of Washington, Landon and Faithlynn Ziegler of Texas. Also surviving is her sister in law, Bernice Whitling Kinney of Youngsville, Pa; a special and dear friend, Peggy Berlin of Knox. Also her wonderful caregivers who treated her like a queen, Kathleen Hosey, Natasia Frederick, Peggy Alsop and Deb Thompson and all the others through the years. Numerous nephews, nieces, great nephews and nieces also survive. In addition to her parents and her husband, also preceding her in death was a brother, Donald Amsler Elder and his wife, Elsie Anna Elder, her husband’s parents, Henry and Ida Whitling, her husband’s siblings, Joe, Paul, Glenn, Frances Whitling and Myrna Foltz and a best friend Jean Konkle Klingler. Visitation will be held on Monday, March 25, 2019 from 2-4pm and 6-8pm at the McEntire-Weaver Funeral Home 504 East Penn. Ave, Knox, PA and from noon to 1 Tuesday, March 26, 2019 at the St. Mark’s Memorial Chapel In Kossuth. Funeral services will be held Tuesday at 1:00 Pm in the church with Pastor Ronald Hunsberger officiating. Interment will follow at the St. Marks Cemetery.